When Rob Gurwitt isn't writing for Governing , he's trying to get more people involved in local government. Rob lives in Norwich, Vermont, a little burg of 3,500 people. Concerned about a drop-off in attendance of Norwich's annual Town Meeting, Rob and three other Norwichians had an epiphany -- lure them with food! 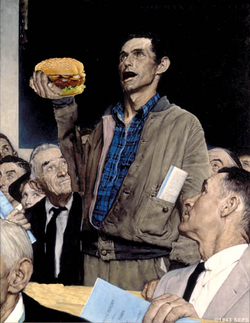 So they created Town Eating, a food-focused Saturday preceding the Monday night Town Meeting. It's a day of breakout sessions and discussion groups about the town -- fueled by coffee and doughnuts in the morning and a free lunch in the middle of the day. Well, they're calling it a "free-ish" lunch, since your payment is your civic engagement. Sounds like a deal to me! Here's a story on Town Eating from Vermont Public Radio.